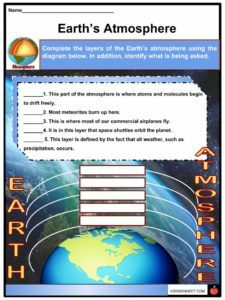 Mesosphere is the third among the five layers of the Earth’s atmosphere. It is located above the stratosphere and below the thermosphere, about 50 to 85 km above our planet. 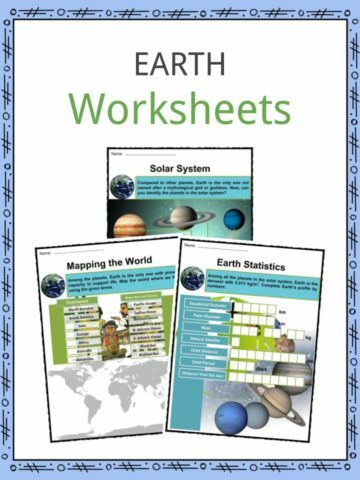 See the fact file below for more information on the mesosphere or alternatively, you can download our 23-page Mesosphere worksheet pack to utilise within the classroom or home environment. 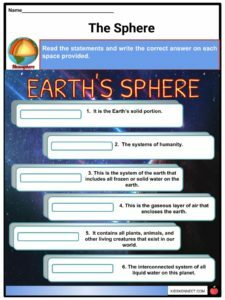 Each layer of the Earth’s atmosphere has distinct traits. 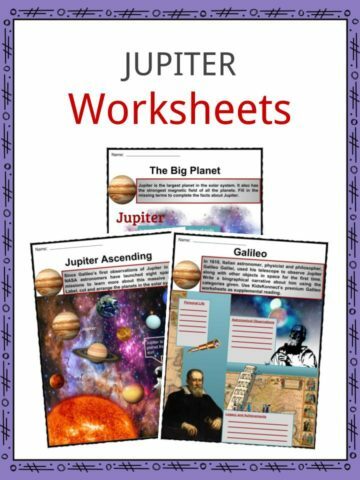 From the ground level moving upward are the troposphere, stratosphere, mesosphere, thermosphere, and exosphere. Troposphere is the lowest layer where humans can live. Most clouds are seen in this layer due to 99% of the water vapor in the atmosphere being here. The next layer is the stratosphere where molecules absorb ultraviolet (UV) light from the sun. Most commercial passenger planes fly in the lowest area in the stratosphere due to less turbulence. The beautiful Aurora Borealis, more commonly known as the Northern Lights, occurs in the thermosphere. This layer has thin air which is freezing cold for humans. The final frontier of the Earth’s atmosphere is the exosphere. It is the space-like part of the atmosphere with extremely thin air. 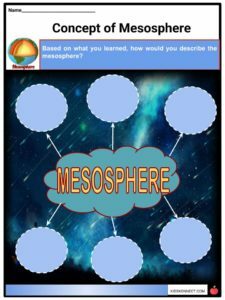 The term mesosphere is derived from the Greek words ‘mesos’, meaning middle and ‘sphaira’, meaning ball. The coldest atmospheric temperature, -90 degrees Celsius, is found near the top layer of the mesosphere. 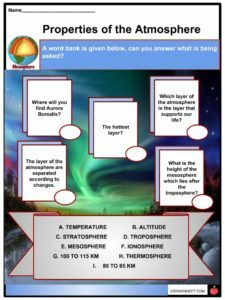 Mesopause is the boundary which separates the mesosphere and the thermosphere. 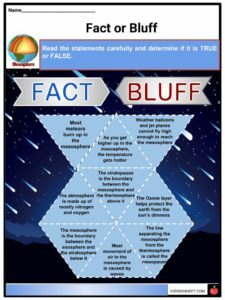 Most meteors are known to burn and vaporize in this level. As a result, the mesosphere has a relatively high concentration of iron and other metal atoms from meteor materials. This function enables the destruction of meteors before it can damage living things on Earth. There are approximately 40 tons of meteors that fall towards Earth every day. When they are burn up, people sometimes see them in the night sky as shooting stars. 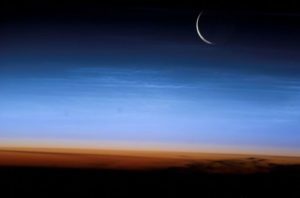 Mesosphere near the poles (north and south) usually forms high altitude clouds called noctilucent clouds or polar mesospheric clouds. This odd type of cloud forms in a much higher altitude compared to other types. Compared to the troposphere, the mesosphere is much drier. Together with the stratosphere, the mesosphere is referred to as the middle atmosphere. This layer is composed of oxygen, nitrogen, and carbon dioxide. As the distance from the Earth increases, the temperature of the mesosphere gets colders. It gets cold enough to freeze water vapor into ice clouds. The zonal winds which flow from north to south, and east to west creates atmospheric gravity waves, atmospheric tides, planetary waves, and strong winds. Sounding rockets or research rockets are used to study the mesosphere. 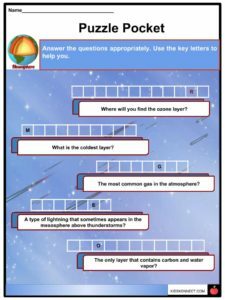 Among the layers of the Earth’s atmosphere, the Mesosphere is the most poorly understood because of the difficulty in studying it. It lies above the highest point for planes to fly, but below the lowest point for spaceships. Sprites and elves are types of lighting which occur in the mesosphere. It appears miles above thunder clouds that form in the troposphere below. Due to extremely thin air, atoms and molecules of gases hardly contact each other. The nightglow or airglow is the light produced from the Earth’s mesosphere. It is located below the mesopause and is composed of unbound non-ionized atoms of sodium. It is sometimes referred to as near space and was first explored in the 1930s. This is a fantastic bundle which includes everything you need to know about mesosphere across 23 in-depth pages. 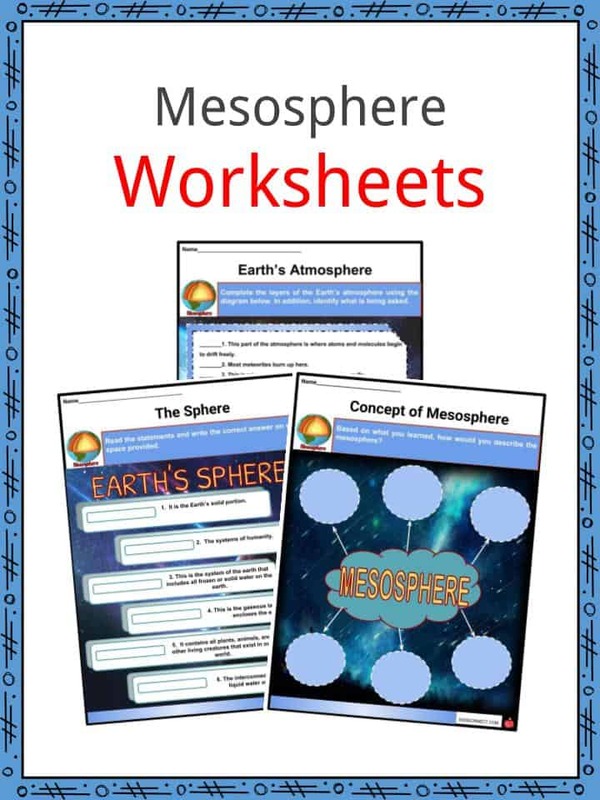 These are ready-to-use Mesosphere worksheets that are perfect for teaching students about the mesosphere which is the third among the five layers of the Earth’s atmosphere. It is located above the stratosphere and below the thermosphere, about 50 to 85 km above our planet.